Being someone who loves to spend money and is addicted to buying makeup I sometimes need to reign it in a little and do things on a budget. Blogging on a budget is definitely something that can be done. I have been blogging over two years and I have put money into my blog on the layout but I try to do things on a budget. Everyone likes to save money right? 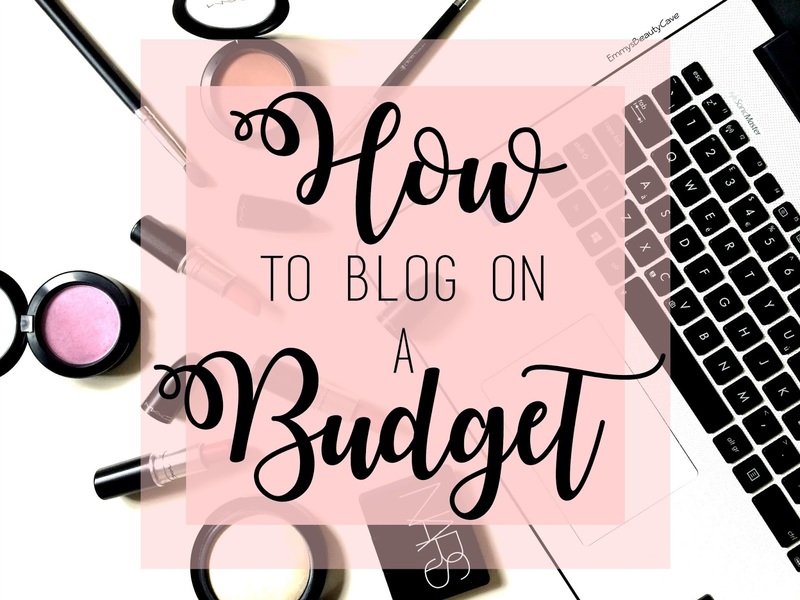 I thought it would be good to do a quick run through of how you can save money blogging whether it be on blog posts or your blogs layout. Don't Buy For The Sake Of It | This is something I definitely stick to, when you see alot of bloggers raving about one product it does make you tempted to buy it. Firstly think will you actually use it? Do you use ones you already own? I do buy some hyped products don't get me wrong but I always think if I will use them first or sometimes if I keep thinking about it I add it to a list and if I am still thinking about it 2-3 months later I will buy it. Try not to buy on impulse! How To Posts | These kinds of posts are very popular and you don't need to spend any money to do them. I take my own stock photo's but you can get some for free online. I prefer taking my own as it means no one else will have the same photo. I keep them in a file then use them when I need them. Like my photo for this post it is one I previously took and used on another post but I just added the extra bits to it. Share Your Blog Button | If you have a blog button why not find another blogger who you could swap with. This way it is free and you are both promoting each others blogs. It is a great way to get more people to see your blog. Your blog button should roughly be 250x250 so that it will fit in a blogs side bar. You can use The Grab My Button Code Generator to create your button and html. All you need is your image URL and blog URL. Guest Post | This isn't one I do on my blog but you can ask bloggers if they would like to guest post on your blog and you guest post on theirs. It is another great way to promote your blog to new readers. Sometimes we don't always have £50 plus spare for a blog layout. The layout I currently have on my blog was around £10. I always get my blog layouts from Etsy. They are very easy to install and they literally have hundreds! 1. Make sure it is a Blogger or Wordpress layout depending what you need. 2. Make sure it says "Mobile Responsive" this means the layout will work well on mobile devices. Widgets | I did a blog posts which listed Free Widgets For Bloggers including a Facebook widget and more! When you start your blog you don't really know what is involved and there are a few things you should spend money on but again without spending a fortune. The better your blog looks the more appealing it is to readers. 1. Some brands/PR's prefer blogs with their own domains as it shows you are serious about your blog as it looks a little more professional. 2. It improves your blogs SEO (Search Engine Optimization), if you are unsure what SEO is or would like to learn more how to improve yours check out my 6 Tips To Improve Your Blogs SEO post. Layout | Blogger and Wordpress do a range of free layouts/templates but they aren't the best. As I mentioned you don't need to pay £50 plus you can get lovely looking layouts from Etsy starting from just £2 upto £100 plus. As I said mine was only around £10. Don't forget to check out some of my other blog tip posts!